Macarons are made out of egg white, sugar and almond powder. These silky cookie sandwiches are filled with chocolate cream for great taste. Packaging for these unique sweets product is very important. These are usually packaged in a unique style packaging that represents the product inside well. Different attractive colors are used for Macaroon Box Packaging to make them stand out. Purple and dark pink are the most used colors for these boxes. The macaroons itself are made out of purple or pink colors so they look nice and tasty. Macaron boxes are usually made in sleeve & try style. Usually sleeve of the box have some interesting cutout window as well so the product is visible from inside. Window is covered with plastic cellophane to make the product safe. For the tray, it can carry one row of multiple macarons or can have multiple rows of macarons. If you are going to put macaroons in one row then there is no need for an insert to separate the sweets inside but if you are loading them in multiple rows then an insert is needed that will separate each row or column of macarons. Custom color printing can be done both on sleeve or tray of the Macaron Boxes Wholesale. 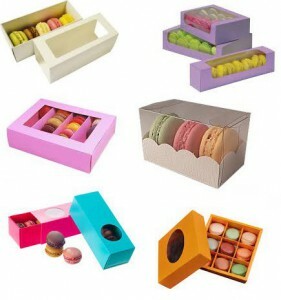 Macaroon box packaging is also made in other styles like two piece box style or bakery style 4 corner style. But the most famous and common are the sleeve & try style as this is the style that was used originally for packaging of these French sweets. As these Macarons are not very popular in US so there are not many packaging factories those make boxes for this product. But many good factories like us make custom printed macaron boxes with full customization of logo, size and style. These boxes can be shipped flat so takes very less storage space and are not that expensive as well.